No 55, Jalan Puteri 2/3, Bandar Puteri Puchong, 47100 Selangor. To reserve your room please follow the instructions on the website and mobile site (as applicable). You will need to provide your credit or debit card details to secure your reservation. We will confirm our acceptance of reservation by sending you an email to the email address that you provide during the reservation process. Check in is available between 2pm – 10pm, 7 days a week. Please inform the hotel at the earliest convenience should you be arriving out with these hours to ensure that our staff are available. Check in after 10pm is liable to surcharge. Reception is only manned between the hours of 8am – 10pm; any enquiries out with these hours can be made via email. We will look to respond to your enquiry as soon as possible. Rates are all payable in Ringgit Malaysia (RM) ONLY. All rates, sales terms, service charge and government tax are subject to change without prior notice. A refundable deposit of RM50.00nett per night is required upon check in. Car parking is available directly In front of the hotel and in a limited number at the rear of the hotel. We only have limited spaces therefore complimentary parking is subject to availability. There is also indoor car park is just 500meters walks away from the hotel. You can leave your car there for RM4.00 per entry. Please inform us before arrival if you are travelling in a group of six or more. We reserve the right to refuse unauthorized groups. Large groups may be required to provide an additional deposit at check-in, returnable on departure if unaffected. Should there be any inappropriate behavior by the group after check-in we reserve the right to discontinue the reservation without refund. Extra bed is chargeable at RM50.00nett per night and subject to availability. Prior reservation is required. Any cancellation or amendment of guaranteed reservation dates must be made at least 48 hours before arrival. Thereafter, full payment of first night will be charged. Check-in time commences at 2.00pm on day of arrival and check out time is before 12:00 hours on departure day. Check in must be made before 10.00pm (Unless pre-arranged with a member of hotel management in writing). Early check-in and late check-out maybe be arranged subject to availability. The Malaysian law prohibits drugs, firearm, illegal weapon(s), smoking, prostitution and gambling in any part of the hotel. The hotel prohibits pet, smoking, durian, mangos teen or any item(s) that may cause damage to hotel or complains from guest. If a guests smokes in there room a charge of RM300.00nett will be made to their credit/ debit card in order to fumigate the room(s), at the discretion of the hotel management. The Management reserves the right to remove any such item(s) without the consent of the guest. 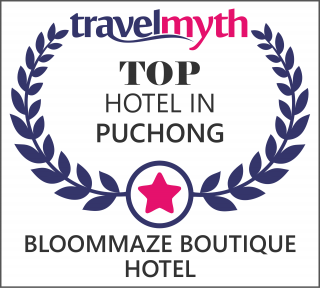 The content of www.bloommaze.com is prepared and/or authorized by Bloommaze Hotel Sdn Bhd – 1125782-A (the Company) and access to or use of this site is subject to the following terms and conditions. Copyright © BHSB 2016. All rights reserved. All copyright and other intellectual property rights in all text, images, sound, software and other materials on this site are owned by the Company and affiliated companies or are included with permission of the relevant owners. References to affiliates or associates shall include all members of BHSB. You are welcome to browse this site and to reproduce extracts from it, for you information and for non-commercial and personal purposes only. The material of this site may not be modified or incorporated in any other work, publication or site without the prior written consent of the Company. All trademarks displayed on this site are owned by the Company. The information and material contained in this site are for general references only. The Company disclaims any warranty or representation of any kind, express or implied, as to any matter whatsoever relating to this site or any linked site to the fullest extent allowed by law, the Company shall accept no responsibility or liability in respect of any damages or loss arising herein. Use of or access to this site does not constitute an offer of goods and service by the Company. Goods and services may only be available in certain countries and any offer to purchase goods or to retain services from the Company is subject to acceptance by the Company and in accordance with the specific terms and conditions on which they are offered. The linking of third party websites to this site does not indicate any association with or endorsement by the Company. The Company does not assume responsibility or liability of any nature whatsoever for the activities conducted or information contained in the third party websites. Other than personal information, the Company shall be free to reproduce, disclose, use and distribute your communications to us onto third parties and to use any ideas, concepts, know-how or techniques contained in those communications for any purpose whatsoever. Communications includes but not limited to feedback, questions, comments, suggestions and the like. When a booking is cancel and entitled to a refund then we will instruct the refund right away. The processing will take between 3 – 4 weeks until the whole amount shows back on your credit card statement due to the billing cycle of credit card company and processing time of the back.